W26 is about 1,500 times wider than the sun, making it the biggest known star in the universe. The red supergiant star is nearing the end of its life and will eventually explode as a supernova, researchers said. Astronomers were using the European Southern Observatory's Very Large Telescope Survey Telescope (VST) in Chile to study the largest star cluster in the Milky Way galaxy, a collection of several hundred thousand stars about 16,000 light-years from Earth known as Westerlund 1. As they peered at W26, which lies within Westerlund 1, the team noticed something odd: The gigantic star is surrounded by a big, glowing cloud of hydrogen gas. This is the first "ionized nebula" ever found around a red supergiant, and it will give scientists a new chance to study how W26 and other stars like it slough off their layers before possibly going supernova, shooting material into the interstellar medium, RAS officials said. 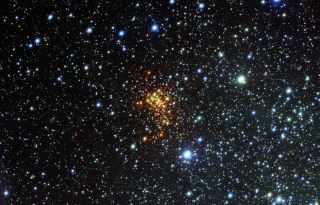 "W26 itself would be too cool to make the gas glow; the astronomers speculate that the source of the ionizing radiation may be either hot blue stars elsewhere in the cluster, or possibly a fainter, but much hotter, companion star to W26," RAS officials said. "The fact that the nebula is ionized will make it considerably easier to study in the future than if it were not ionized." A new photo of W26 and Westerlund 1 shows the ionized nebula glowing green, standing out in a blanket of stars. Despite its size, the cluster looks somewhat dim because gas and dust obscure its view in visible light from Earth. The VST instrument was able to peer through that cosmic haze to investigate the star cluster and W26. The new research is detailed in the Monthly Notices of the Royal Astronomical Society. Follow Miriam Kramer @mirikramer and Google+. Follow us @Spacedotcom, Facebook or Google+. Originally published on SPACE.com.